Are you looking for fun outdoor activities to do with the entire family this winter? 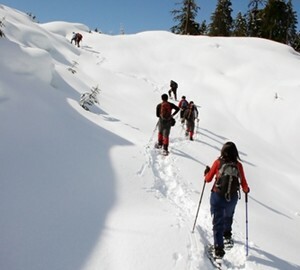 Try taking a twilight snowshoe tour at Northstar California Resort at Lake Tahoe. Northstar, a unique, upscale mountain resort, is offering four guided evening tours in February and one in March, so guests can enjoy a tranquil experience of the lovely Sierra Nevada. The adventure will last for 2-2.5 hours, and will include some cozy hangout time around a fire pit as well as s'mores and hot chocolate. This is the perfect opportunity to slow down and appreciate the peaceful beauty of your natural surroundings. Guests will meander through the pines on a blanket of snow, and dogs on leashes are more than welcome to join in the fun! At the end of the journey you'll find yourself at one of the finest alpine villages in the United States, where there is ice skating, shopping and fine dining galore. If you're interested in attending, you can register for the event here. Northstar is just another example of how California offers some of the most stunning landscapes in the nation, as well as the most entertaining activities and special events for all ages. Take advantage of the area's unique, temperate climate — skiing and snowshoeing in the winter, together with mild, fresh and sunny days — by adventuring outdoors. If you're in the market for Placer County real estate, contact Jon Hesse, an experienced agent who has sold over $100 million of real estate in the last four years. Jon Hesse knows that every buyer has unique needs, and he can help you find exactly what you're looking for, whether that's a first home you and your partner or a larger place for your growing family.